While supplies last, PanelToPanel.net is making the book plate pictured left, previously available with last year's Tales of the TMNT Vol. 5 TPB collection, once again available with copies of the original TMNT Collected Book Vol. 4 from 1990, which collects the classic story "Return to New York." If you don't have this book plate, this is a deal you don't want to miss. If you don't have this collected volume, this is especially a deal you don't want to miss, since it seems unlikely that we'll be seeing these issues reprinted anytime soon, if ever again. If you haven't checked it out yet, yesterday's TMNT episode of Nerdy Show is now available. Thanks to the guys for being great hosts!! I will be a guest on tonight's episode of the "Nerdy Show" podcast. The show records live from 9pm-11pm EDT, with the first hour of the show likely to be Turtles talk. 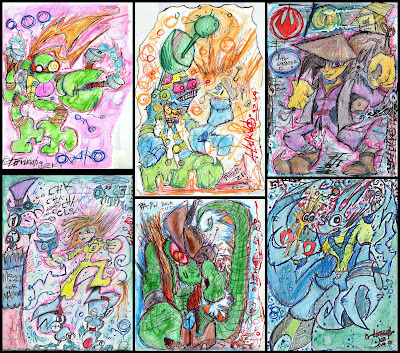 And perhaps obviously, the focus of the discussion will be last week's sale of the TMNT to Nickelodeon. You can check out the live recording at Justin.tv. They hope to have it available for download ASAP, possibly within an hour of completing the recording. At worst, the podcast will be available tomorrow from their Web site. I'm a little nervous about this, but also excited! And I expect it'll be fun! As you'll recall, one of the first victims of last week's announcement was the canceled publication of the "Mirage Universe" book. And with no book to release, that left PanelToPanel.net's awesome Dan Berger-created book plate without a home. No longer! 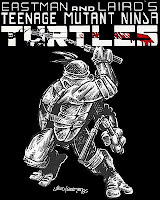 The book plate will now be included with copies of the TMNT Vol. 1 #1 color reprint (below) that is scheduled for December. At only $3.25 a copy, it's a steal! Someone said to me via Twitter this afternoon, "Please help me figure out how I am supposed to feel about the sale.. I am so confused!" Well, I can't tell you how you should feel about this, but perhaps by saying how I feel about this I can offer a bit of perspective. I am not shocked, nor horrified, nor any degree of outraged or upset about the complete sale of the TMNT property to Nickelodeon. Ok, I take one part of that back. While I'm not shocked that Peter Laird sold the TMNT to Viacom/Nickelodeon, I am a little surprised at the timing. Given the investment Mirage put into the TMNT 25th Anniversary (with no shortage of the use of the word "shell-ebrate"), it is rather shocking that in the same year Mirage (more specifically, Peter Laird) would "quit" the Turtles. And, similarly, I can't quite wrap my head around Mr. Laird's insistence on certain (and generally unpopular) creative decisions when he was apparently so willing and ready to wipe his hands clean of the whole thing for a "little" bit of cash. I can't help but wonder just how long this deal has been in the works and how much of this "shell-ebration" has been a complete sham of a diversion from what was going on behind the scenes. 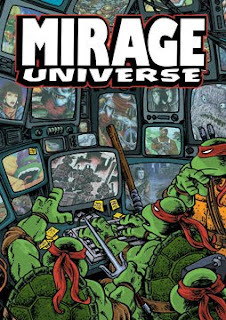 Or, perhaps, it could be viewed as Mirage giving the TMNT, and the fans, one last "Hurrah!" before letting them go. While deals like this really don't afford it, it would have been nice to have been given a little notice of these plans so that we, the fans, could return the favor and give a last little "Hurrah!" back to the creators and the creations that many of us have held onto for a significant part of our lives. There's still a little bit of time left before all strings are cut, so perhaps that opportunity still exists. 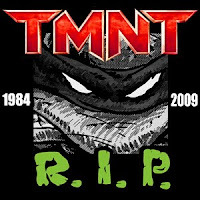 But it seems that the TMNT are fated to never receive a proper farewell whenever they depart, be it from TV, comics, movies, or now the studio from which they were born. It seems that Mirage will once again become its illusionary namesake. The truth of the matter is that the TMNT have been flailing as a franchise for awhile. High expectations have fallen short, and some expectations haven't delivered at all. It certainly hasn't helped that Mr. Laird so obviously had lost the interest and motivation that would be required to set everything back on track again, and with a seemingly equal lack of motivation to get anyone else to do those things (or, simply, willingness to let anyone do those things). This is the end of an era, and there are sad elements about it, and this fandom is in for some serious changes. But I am seriously hopeful and excited for what the future now brings. Because now I can at least see a potential for a bright and positive future, instead of more flailing that just makes the TMNT look a bit sad and pathetic. Because I know that, in fact, they are so, so capable of being so, so awesome. A lot of questions still remain about how the transition from Mirage to Nickelodeon will proceed, but I say: Bring on the Future. News is spreading across the various wire services and news Web sites this morning that Nickelodeon has apparently acquired the global rights to the TMNT. It is also being reported that they will develop a CG-animated TV series that will be concurrent with the existing movie project, which is now slated for 2012 and will be distributed and backed by Paramount. NEW YORK, Oct. 21 /PRNewswire/ -- Furthering its mission to provide premium content to its audiences, Nickelodeon--part of MTV Networks, a division of Viacom Inc. (NYSE: VIA, VIA.B)--has acquired the global rights to the Teenage Mutant Ninja Turtles from The Mirage Group and 4Kids Entertainment, Inc. (NYSE: KDE). The acquisition provides Nickelodeon, the world's number-one entertainment brand for kids, global intellectual property rights to Teenage Mutant Ninja Turtles, the hit television, film and video game property that has delighted kids around the world for the last 25 years. The aggregate purchase price for the transactions is approximately $60 million. Nickelodeon also announced plans to develop a new CG-animated television series based on the popular superhero franchise, anticipated to premiere in 2012. 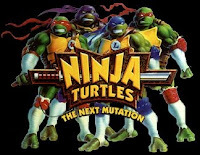 Additionally, in partnership with Viacom's Paramount Pictures, a new release of a new Teenage Mutant Ninja Turtles feature film is also planned for 2012. Nickelodeon has also acquired all merchandising rights to Teenage Mutant Ninja Turtles, and will continue to work with its original and long-standing toy partner, Playmates Toys, which has been the creative force behind the successful TMNT master toy program over the last two decades. "Teenage Mutant Ninja Turtles shares a comedic sensibility with the Nickelodeon DNA, with added layers of action and fantasy that have kept this property an evergreen favorite with multiple generations of audiences," said Cyma Zarghami, President, Nickelodeon/MTVN Kids and Family Group. "We are extremely happy to have the opportunity to be able to focus on this property and creatively re-introduce it to a new generation of kids." "Teenage Mutant Ninja Turtles is a property that maintains a very passionate global fan base, is rich with opportunity for a tentpole movie, and is exactly the right property for us to work together with Nickelodeon," said Adam Goodman, President, Paramount Pictures. 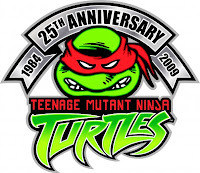 "Mirage has been the proud keeper of the Turtles' brand since 1984, and in 2009 we celebrated their 25th anniversary with our legions of fans," said Gary Richardson, CEO, Mirage Studios. "Nickelodeon is a powerhouse global brand, and we are confident that the company will be a wonderful steward for Leonardo, Raphael, Michelangelo, Donatello and all the other TMNT characters and take them in all kinds of exciting and new creative directions." Stay tuned to Ninja Pizza as details on this become more clear, particularly concerning what, exactly, this means for the future. PanelToPanel.net now has the upcoming Mirage Universe sourcebook available for pre-order. While supplies last, all copies of the book ordered through PanelToPanel will include an exclusive book plate (below), created by Dan Berger. These always sell out quickly, so get your orders in now! Preview Clip from "Turtles Forever"
Astute Technodrome forum member WEB4KIDZ has found the first preview clip from "Turtles Forever"! You can check it out at WorldScreen.com, or below. 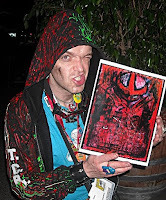 And check it out - "Ninja Pizza" representing! Jimmy Fallon, of the Late Night with Jimmy Fallon show, is an expert at deducing the many faces of President Barack Obama. On last night's show, Fallon revealed Obama's fanboy love for the TMNT.